Success in polar travel essentially boils down to making a long list of decisions, topped off with that final dose of chance which you can't control. Whilst in the process of nurturing a polar idea into something ready to take onto the ice, literally thousands of yes/no or more complex choices must be made. Some are easy and change little throughout the decades: should we take skis? Yes (although in fact one recent North Pole journey used snowshoes in their place). Some are very personal and frankly make next to no difference to success: should I wear merino wool underwear from this manufacturer or that manufacturer? Some could actually be mistaken for being in one of those former categories and these are the interesting ones. It is, as we see year on year and decade on decade, so easy to blindly follow the crowd. Of course, many times a cliche is a cliche for a reason - it's the right choice. Sometimes however, well, we shall see. On the list of 'things to get right', I'd argue that shelter is right up there. Major unsupported polar expeditions can very rarely get away with taking backups of such heavy items and so there is little room for error. A lost tent through storm, bear attack or fire is in the vast majority of cases, fatal. The 'default' choice of mobile polar parties is the double-fly silicone coated nylon tent - either in geodesic (dome) or tunnel format. When you know which direction the wind is coming from most of the time (on large icesheets), weight is critical and the sun is up in the day (or all night too), these make a lot of sense. You can get a two person expedition tent weighing less than four kilos and they are quick to use in practiced hands. However, they struggle in side winds, are cramped and cannot breathe. I looked back at history and tried to shed the blinkers which so often stifle the innovation in modern polar travel. Semi-permanent structures are great for basecamps and non-mobile expeditions and the heavy pyramid tents (weighing over thirty kilos) had their uses, but what about that age-old design of the tipi? In simple terms, a symmetrical canvas supported by a single vertical pole. Tentipi had come to my attention some months previously and I started reading and talking to others about them. Soon, I knew I just had to try one and their Swedish manufacturers agreed to send me a Zirkon 5 cp. There could not be fewer things in common between my old Lightwave and Hilleberg workhorses and this traditional-looking yet defiantly modern shelter. The single pole was much larger and stronger. The canvas was a single layer of polycotton - feeling more like fabric than the plasticy sili-nylon, but of course heavier. This is easier to sew than nylon if ripped and burns more slowly too. It was a single space inside, with no porches and of course, tall enough to stand up inside. On paper, for an expedition of the length of Dark Ice and also on polar terrain where the winds would be lighter yet more multi-directional than on icesheets, it seemed perfect. Without dwelling too much on the misfortune of the past and anyhow, the episode is documented fully in Maybe, the lack of ice-time in the winter of 2012/13 meant that I could not fully complete the transition to tipi-traveller. We had used it only a few times. Prior to even that first phase of the journey though, I had asked a London-based sailmaker to make modifications - almost always the way with off-the-shelf products destined for serious Arctic use. 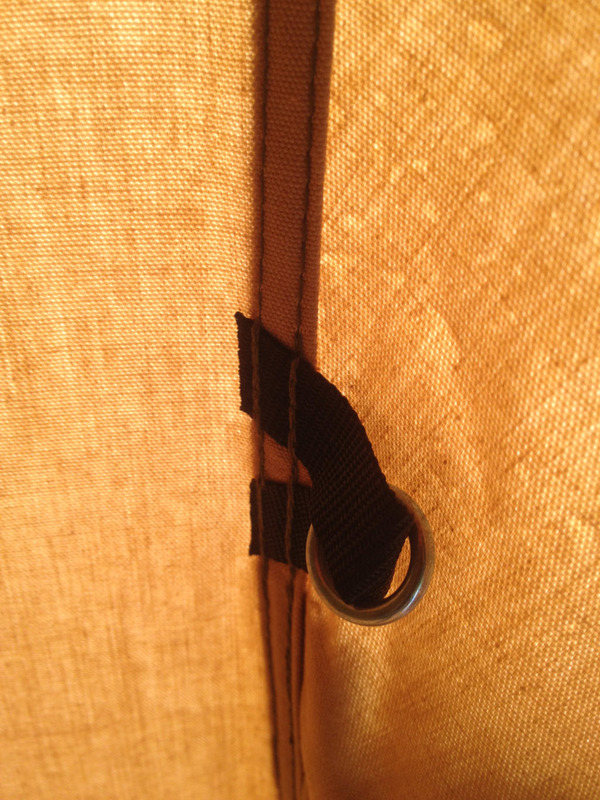 The internal drawstrings to control the windows in the top of the tent were removed and the flaps stitched closed, leaving a velcro vent to allow moisture to escape. Double D-ring backups were sourced for the tensioning straps and extraneously additions removed to save weight. A circular piece of plate aluminium was milled from scratch to keep the central pole under compression and on the snow surface. The polycotton is the major constituent of the Tentipi and is the strength inherent in its design. Yes, it's heavier than double nylon by about 40%. However, and this is critical, it really does allow water vapour to pass through, meaning that the inner walls of the tent are not covered in frost in the morning, the humidity is kept low when cooking and therefore, insulated lynchpins like sleeping bags stay drier. The greenhouse effect of the sun beating down on a double fly tent and creating a warm air layer in between the flys is not relevant on Dark Ice and so the tipi does not suffer. A nylon inner can be added but it would be counter-productive for us. Without two nylon sheets flapping about against each other, the polycotton is remarkably quiet too, at worst being a lower-pitch 'whoop' sound when the wind picks up. 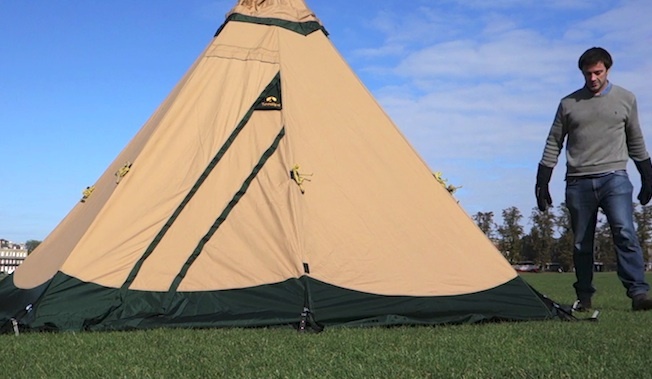 Before the tipi gains any elevation when being pitched, thereby becoming susceptible to the wind, it is already securely anchored to the snow or ice in an octagon - ice screws, skis, poles or bags of snow can be used as anchors. This is a massive safety feature and makes the loss of the tent in a storm even less likely. The circular symmetry of the Zirkon means that the wind can change direction by ninety degrees during the night, and we don't need to bat an eyelid. Dave, our dog, might want to move a little bit back into the lee of the tent though! The central height of over six feet allows for people to stand up and dress/undress in comfort and the footprint lets kit be stored around the edges and sleeping mats arranged around the centre. A V-shape in front of the door is kept ground sheet-free for boot storage and an easy exit. This is probably the most under-rated reason for having one tent over the other but could even be the most significant. Perhaps only those with multi-month journeys under their belt can fully appreciate its importance. Is it a nice place to be? The psychological impact of your home, when away for vast tracts of time, being inviting and easy to live in can make the all the difference. In this respect, the tipi really does have the X-factor. I can see myself calling it home for the vast majority of the winter, spring and part of the summer of 2013/14. I might even start to consider the Tentipi for use on icesheet expeditions too. Food for thought. New website, new team and new brand partner!